I scored some great vintage finds over the weekend. I feel like I've been having the worst luck lately and end up always coming home empty handed but this weekend definitely made up for recent trips. 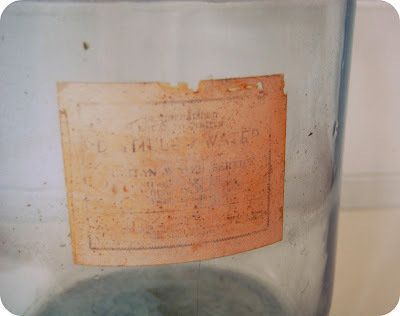 My favorite find was an old carboy from the 1950's. I plan on using it as a vase and putting some large decorative branches in it or something. I love the industrial look it has to it with the worn label and the gorgeous blue tint. This definitely makes up for that demijohn I wasn't able to bring back with me from the Berlin flea market.